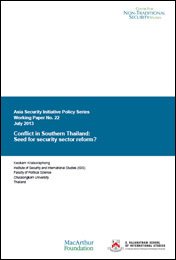 This paper explores the prospects for security sector reform (SSR) in Thailand in light of the protracted violent conflict in its southern provinces. The central question is whether the Thai military, known for its past success in ending communist insurgency, has the adaptability and flexibility to cope with the current violent resistance to state authority in the country’s south. To answer that, it would be necessary to first understand the context under which the military was successful in quelling the communist insurgency of the past, and the situation in the south today. As this paper shows, the two cases differ in fundamental ways; and the paper concludes with guarded optimism that the military would adjust its conflict management approach to address the challenges posed by the changed circumstances.